WHISTLER, British Columbia (AP) — Someone had to be first, and it was Tony Benshoof. Overlooking a labyrinth that claimed the life of one of his competitors a day earlier, Benshoof, the top U.S. medal hope in men's luge, drew a breath of mountain air, secured the visor over his face and dropped down this elevator shaft of ice not knowing what to expect. He glided to the bottom, slower but safer. And that's all that mattered. The Olympic sliding track, slightly modified to make it less perilous and more than 5 mph slower for racers, reopened Saturday less than 24 hours after Georgian luger Nodar Kumaritashvili died in a horrifying crash not likely to be forgotten by anyone who witnessed it on Blackcomb Mountain or on television. For Benshoof, there was no time to mourn. "Unfortunately, there was a terrible tragedy," said Benshoof, a three-time Olympian competing with at least three herniated discs, plus an aching foot from a brush with the Whistler track wall on Friday. "But at the end of the day we have a competition to go through and I tried to put it all out of my head." Reminders of Kumaritashvili's death seemed everywhere — from the reconfigured final curve and raised wall, to the black tape stuck to the helmets of some athletes. Flowers were left by the base of a steel beam that he struck near the 16th turn. There was also a card with the inscription, "Just like gold, your dream will live forever." A moment of silence was held before the first heat of the men's competition in memory of Kumaritashvili. His photo was displayed on a video scoreboard. "It's still fresh in our hearts," said Shiva Keshavan from India. "We're not able to compete with that same joy." Kumaritashvili's teammate, Levan Gureshidze, did not race. He was on the official start list for the first heat but withdrew. International Olympic Committee president Jacques Rogge attended the competition with Vancouver organizing chief John Furlong. Before Benshoof pushed down the starting ramp and cleanly navigated through the 16-turn course, luge officials announced the men would begin at the women's start, a decision they hoped would reduce speeds and lessen the chance for accidents. International Luge Federation officials said the start change for the men — three turns below normal — was made with the "emotional component" of athletes in mind following the death of the 21-year-old from the former Soviet republic. It wasn't the only switch: Later, officials said the women's and doubles competitions will start even lower, at the junior start position, between the fifth and sixth curves. The men began their two-day competition with a clean first heat, with all 38 racers completing their runs. Italy's two-time defending gold medalist, Armin Zoeggeler, who crashed on Friday not long before Kumaritashvili's fatal spill, was third after the first heat, behind Germans Felix Loch and David Moeller. Benshoof was seventh. Kumaritashvili was nearing the finish line of his sixth practice run and a day away from competing in his first Olympics when he lost control of his sled in turn 16, was propelled through the air and slammed into an unpadded steel support pole at nearly 90 mph. The spot where he lost his life looked very different on the first official day of the Vancouver Games as track officials, following an investigation and concern about the track's safety, had the exposed steel beams covered by a 12-foot-high wooden wall. Others were wrapped with padding. The contour of the final, sweeping turn, nicknamed "Thunderbird" was also changed as workers shaved the thick ice to stop racers from drifting too high onto the curved walls, increasing their chances of crashing. While all the changes satisfied IOC officials, they also seemed to be a concession by luge's governing body and Vancouver organizers that the $110-million track, built to be the world's fastest, was beyond what some competitors could handle. "We never said it is too fast," FIL president Josef Fendt insisted. But even to the untrained eye, it was obvious the lugers were crawling compared to the zooming speeds they reached in the first days of practice. "It's slow," said Austria's Manuel Pfister, who was clocked at almost 96 mph on Thursday. "It's completely different. Yesterday, I was able to slide with the medal ranks, today it's another race. It's difficult for me. Maybe it's now too easy." The decision to change the start's location seemed to have the desired effect during men's training, the first session on the track after Kumaritashvili's terrifying crash. None of the athletes broke 90 mph after speeds routinely surpassed 95 mph earlier in the week. "The changes that they made were positive," Benshoof said. "I didn't notice them going down the track itself. Of course, now, with a lowered start, it's significantly slower, significantly easier and significantly safer. Personally, I'd rather go from up top because that's kind of my personality and my driving style. "But I think generally speaking, it was a good decision." Two women's training runs were completed without a problem in a light rain. Earlier this week, there was a nasty wreck involving a Romanian women's luger and a few other crashes. 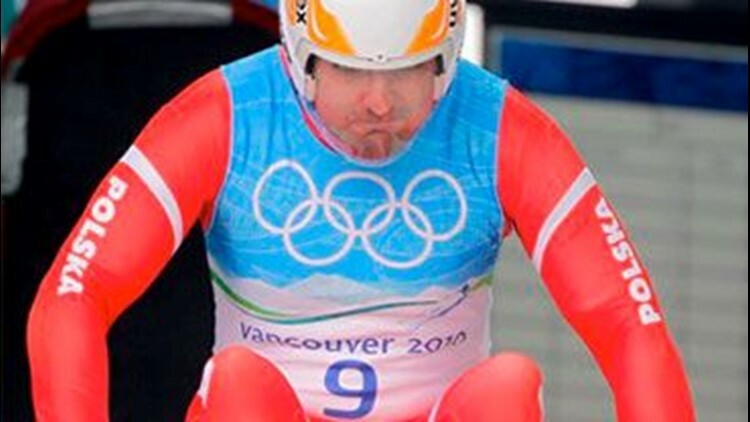 Kumaritashvili's death was believed to be the first on a sanctioned luge track since December 1975, the federation said. "We have to go on," he added. It remains unknown if the start positions will be changed for upcoming bobsled and skeleton competitions, a decision that will be made in consultation with the governing body for those sports and not the FIL. Romstad said the G-forces generated by Kumaritashvili exiting the 15th curve and entering the 16th and final curve "literally collapsed his body, rendering it difficult to control the sled, which in this case he was not able to do. "Once this happened, he was literally at the mercy of the path of the sled," Romstad said.